The Justice and Development Party (AK Party) came in first in Sunday’s local elections, winning 16 percent more votes than its closest rival, the Republican People’s Party (CHP). The People’s Alliance, which won 51.7 percent of the vote with the Nationalist Movement Party (MHP), its alliance partner, overwhelmingly surpassed the alliance of the CHP, Good Party (İP) and Felicity Party (SP), which won 38 percent of the vote. In addition, the AK Party won Peoples’ Democratic Party (HDP) strongholds such as Bitlis, Şırnak and Ağrı and boosted its power in Kurdish-majority cities. This was also the approval of the policies of President Recep Tayyip Erdoğan, who has been recently carrying out a strong struggle against the People’s Protection Units (YPG), a PKK offshoot. While HDP votes declined in all Kurdish-majority provinces, AK Party votes were on the rise. At the same time, however, obviously, it is time for the AK Party, which lost metropolises such as Antalya, Adana and the capital of Ankara, to adopt a new discourse and policy in metropolises. At the moment, everyone has been watching to whose favor will the 0.002 percent difference between the AK Party and the CHP will end up. 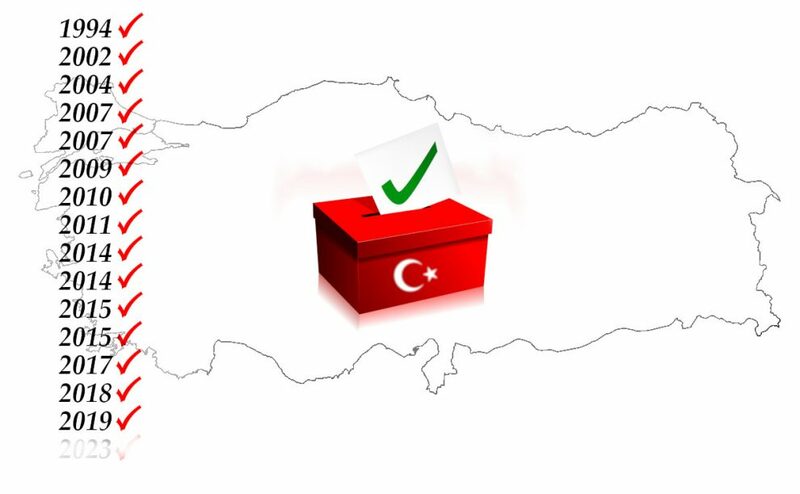 After the AK Party’s applications, incorrect vote entries in the system by ballot box numbers or votes that were unfairly cancelled are being corrected in some districts of Istanbul. In other words, a re-counting process continues at district election boards that accepted the AK Party’s appeals. There are also districts such as Beyoğlu and Beylikdüzü which did not accept the counting. During the recounting process, each party has its own watchdogs. On the other hand, the CHP has requested recounting in some districts such as Sancaktepe or in some provinces such as Bursa where they lost, and votes are being recounted accordingly. In this recounting process, the majority of the votes sometimes turn out to be for the CHP’s candidate and sometimes for the AK Party’s candidate. For instance, as CHP Kadıköy District Chairman said, 425 votes have been added to the CHP candidate in the recounting. What is hard to understand is that U.S. or German authorities press Turkey to “accept the result,” while the recounting process continues in some other provinces of Turkey and it is an ordinary legal process which is resorted to in a number of elections from U.S. presidential elections to European elections. Every election is a re-affirmation of democracy. Although results are not predictable in a country like Turkey where the electoral turnout is over 85 percent and whose fair and transparent electoral system is accepted by international watchdogs as well, there is one thing certain: President Erdoğan has a mandate until 2023 and Turkey will have a 4,5-year election-free period. This is an excellent opportunity for Turkey both to achieve its foreign policy goals, especially peace in Syria, and to focus on domestic issues, especially economic reforms.